Please note that some animals may not be visible to visitors as we strive to provide the best medical care to the patients as possible requiring us to sometimes have the animals in pens farther away from the viewing platform. Last update: 4-19-19 Time: 4:06 p.m. The information on this page is typically updated daily Monday – Friday. For general species information; including description, range, habitat, age class chart, etc. click on the common name above the picture of the species in which you are interested. Hawaiian Monk Seals: Find out about the Current Hawaiian monk seal patients at Ke Kai Ola. Last update: 4-19-19 Time: 4:06 p.m. If you do not see the patient you are looking for, visit our Released or Deceased page. 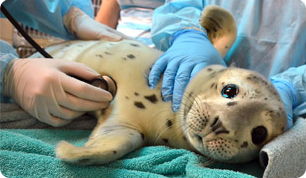 Please email edu@tmmc.org if you have a question about a particular patient.